Growing up in Stroudsburg, Pennsylvania, daddy loved two things: my mother and speed. He started dating my mom when they were in high school nearly 70 years ago and they were married on May 2, 1942. He raced his cars up and down through the mountains and fantasized about flying. In 1941, he joined the Army, but after finding out that the definition of “infantry” meant walking, he requested a day-pass and went to take the Air Corps exam. He got busted for that about the same time as he received his acceptance into the Army Air Corps. Daddy’s last school before being sent overseas was in San Angelo, Texas. Serving with the 15AF, 460th BG, 762nd BS, he flew missions out of Foggia, Italy and was shot down over Vienna, Austria on his 38th mission, July 8, 1944. Stopping to fold up his parachute for a young couple who wanted the material for a wedding dress, he was severely injured by civilians who turned him over to the local police, then the German Army. After being interrogated at a Dulag Luft, he was sent to Luft 1 in Barth, Germany, on the North Sea. In early May 1945, as the war was ending, the German guards left the camp, and daddy began walking east (the wrong direction) with a number of other POWs. They were picked up by the Russian Army, who sent them back to camp. Col. Zemke (the camp ranking officer) and his men – including daddy – were then flown to France, to Camp Lucky Strike and finally boarded a ship home. During peacetime, he served as an Air Force Photo Officer and as Defense Counsel with the new Air Force. After retiring from the military, he worked for the Treasury Department – first with the US Mint; later with the US Customs Service – and he retired from the Federal Government in 1982 when he became active with the American Ex-Prisoners of War. He was Chapter Commander and later Department Commander in Maryland, and National Director-at-Large. In March 1987, he was appointed the first Executive Director for AXPOW with responsibility for the National Capitol Office, which he had opened in 1986. “Cut me a check, Sally” became one of his favorite expressions every time the office needed to buy something, and then-Treasurer Sally Morgan always responded with “Show me the line item, Chuck." He was a member of the Presbyterian Church, Masons, Scottish Rite, Shrine, Sojourners, Heroes of ’76, Capitol Hill Shrine Club and Advisor to DeMoley. In addition to AXPOW, his Veterans Association membership included: 15th AF Society, 28th Division Society, American Legion, MOPH, DAV, VFW, TROA and Caterpillar Club. He was also an early president of the Combined Veterans Council, and was convinced that if only the veterans’ organizations would band together and speak with one voice, they would be invincible. In early 1994, daddy’s health began deteriorating and he was forced to retire from the “best job in the world”. At the Mid-Year conference, his retirement party list read like a “Who’s Who” of Veterans Service Organization executives and we were honored to have both Secretary of Veterans Affairs Jesse Brown and Deputy Secretary Hershel Gober in attendance as well. Even though mom and daddy moved to Cape Cod near me in 1999, daddy never stopped wanting to get back into Washington politics. On Father’s Day this year (just nine days before he died), he asked me if anyone was flying down to DC on a regular basis; he wanted to spend one week a month “educating” some of the new Congress. Now he’s back in Washington full-time. 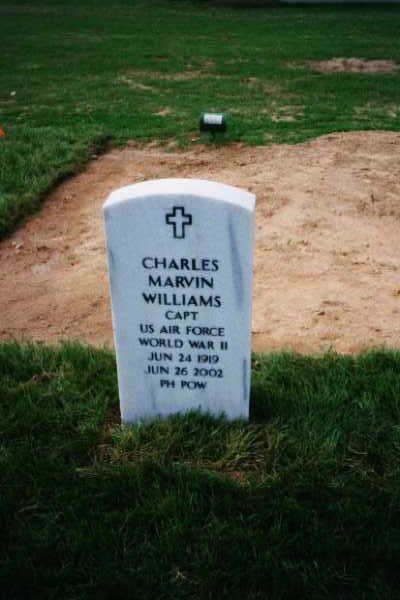 He was buried in Arlington National Cemetery on July 24, 2002. He leaves behind my mother, Ruth, my daughter, Jessica, and me.